Nowadays, when cooking for even just a couple of guests, there seems to always be someone who’s intolerant or allergic to certain foods, or on a special diet due to a more severe medical condition. 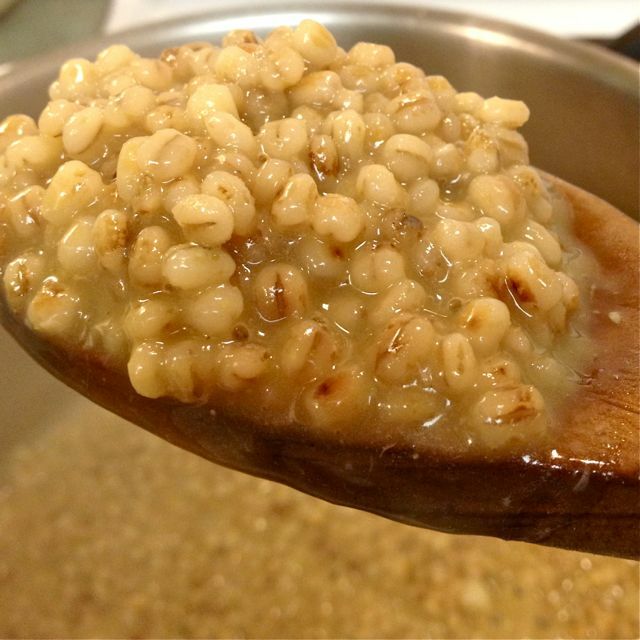 Mom used to toast the barley in her version of essentially an oven-baked barley risotto. 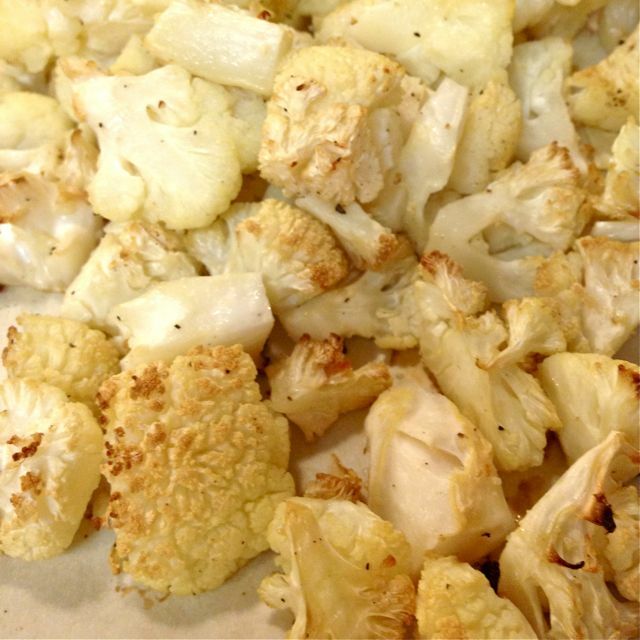 Here I’ve toasted the barley, and roasted the cauliflower giving the dish a wonderfully earthy flavour, so that once again, every last scrap will get eaten. I’ve put quote marks around risotto, as there isn’t a “scrap” of rice in it! Roast for 30 minutes in the top half of the oven, if using only one sheet. While it’s roasting, heat a heavy bottomed Dutch oven (at least 4 litre or quart size) over medium heat. 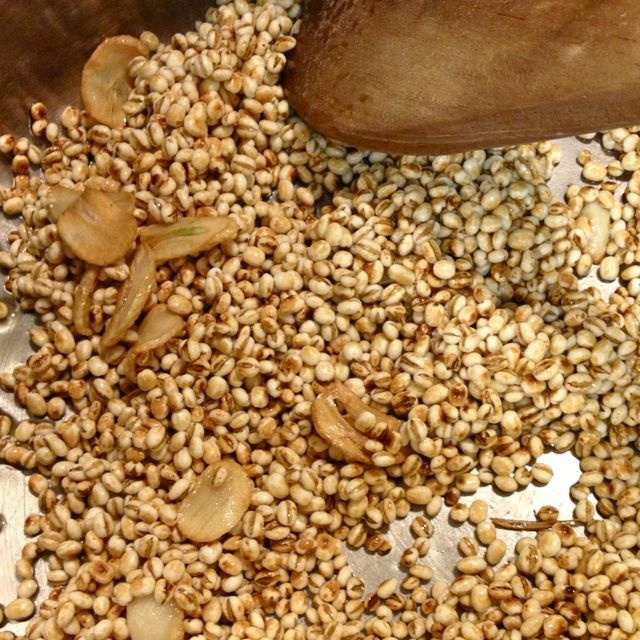 Add in the barley and stir until it is toasted and fragrant, about 8-10 minutes. 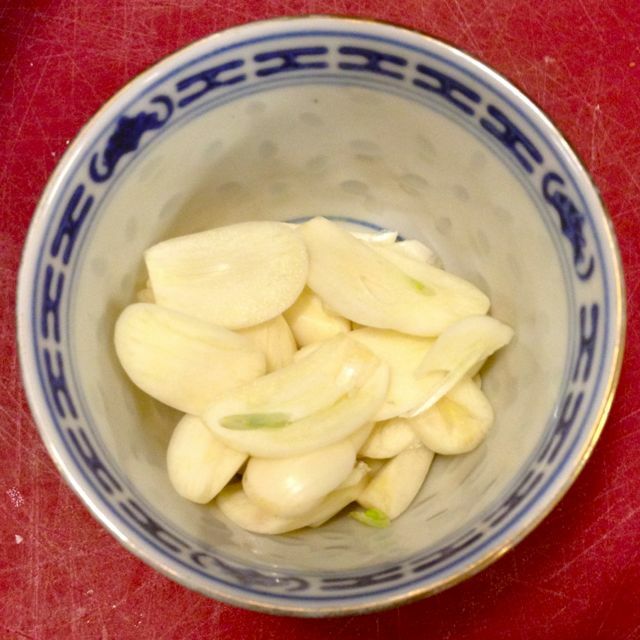 Remove from the pot to a bowl, reserve. Heat the stock in a medium size pot to a boil, and then reduce to a simmer. 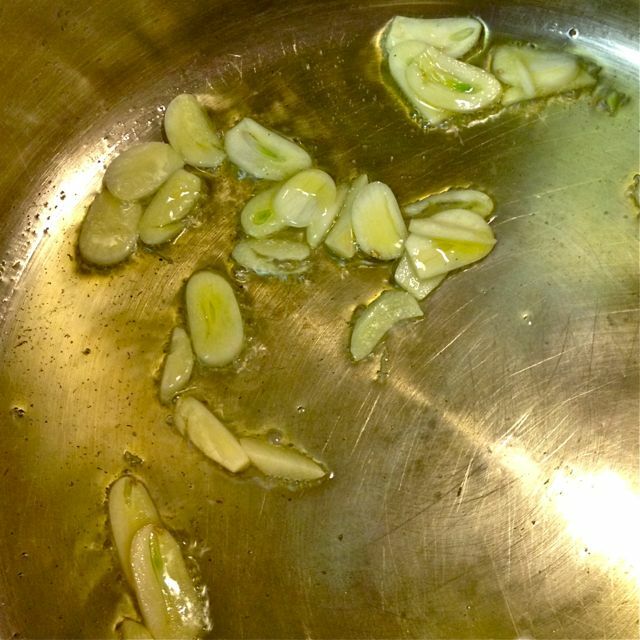 While the stock heats, heat the remaining 2T of oil in the large pot, add in the sliced garlic and cook at medium heat until the garlic is golden, about 3 minutes. Add in the barley, stirring until all is covered with the oil. Slowly add the wine to the barley, stirring constantly, until it is all absorbed. Using a ladle (if you have a 4 oz, that’s best) add in about ½ c of the simmering stock to the barley. Stir as you did the wine, until all is absorbed. 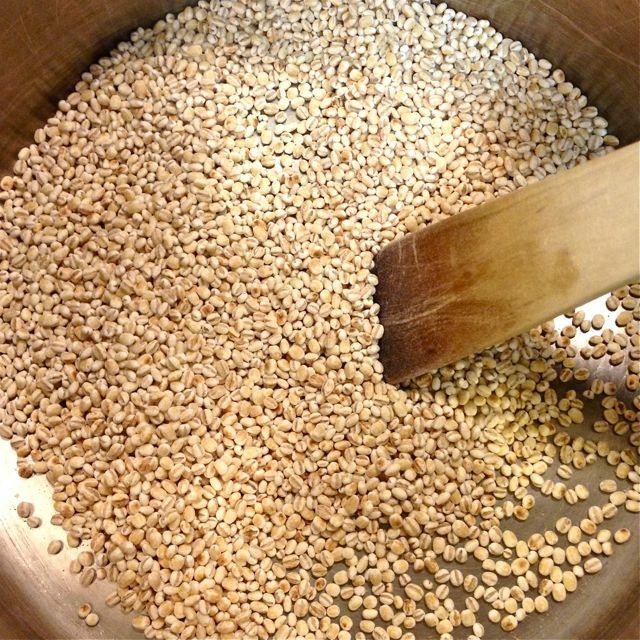 Continuing adding stock, ½ c at a time, and stirring, until all the stock has been used. This can easily take up to 50 minutes. You don’t have to watch it like a hawk. Stir for a bit, drink some wine and talk to your dog or your guests. 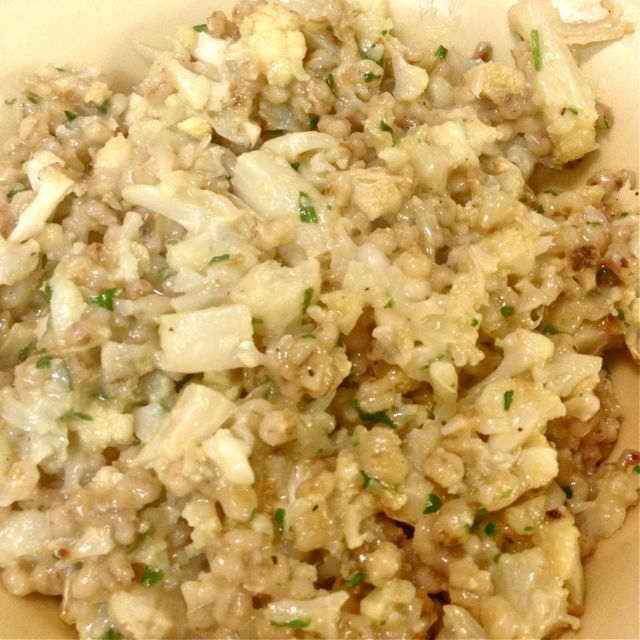 Once the barley is creamy and tender, add in the roasted cauliflower. 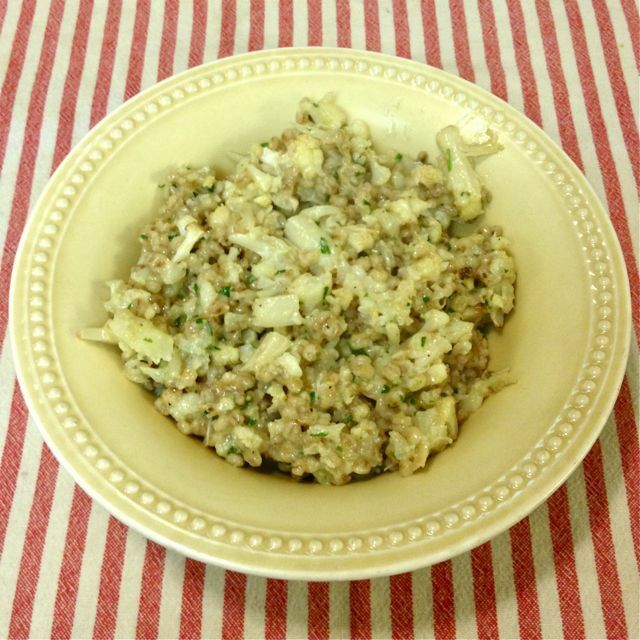 Stir gently, but thoroughly, you don’t want to mash the cauliflower. Then add in the butter, cheese & parsley. 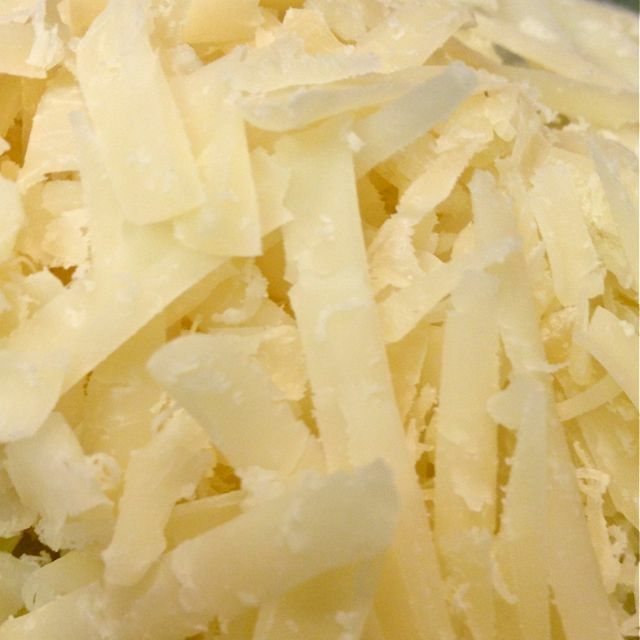 Stir until the butter & cheese has melted. Serve with a crisp green salad alongside. 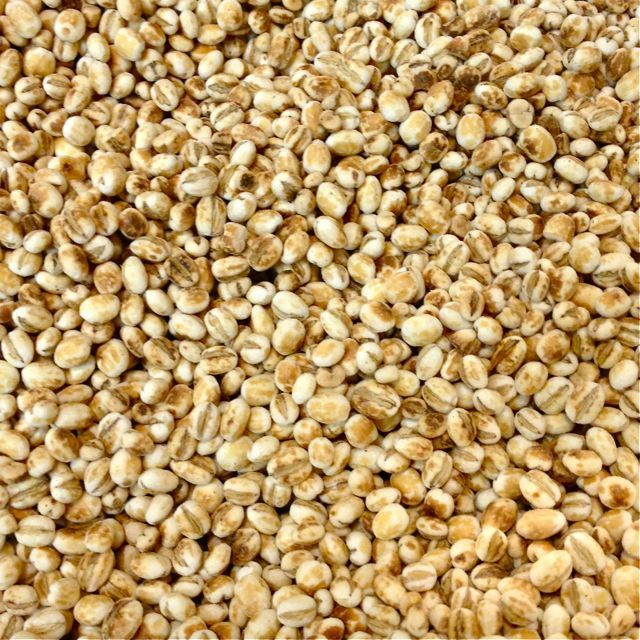 Options & Additions: using Pearl Barley instead of Pot Barley – it is polished, and doesn’t have quite the nutritional goodness of Pot Barley, and it will cook faster, using less stock. If you’re in a rush, this will take off about 15 minutes. 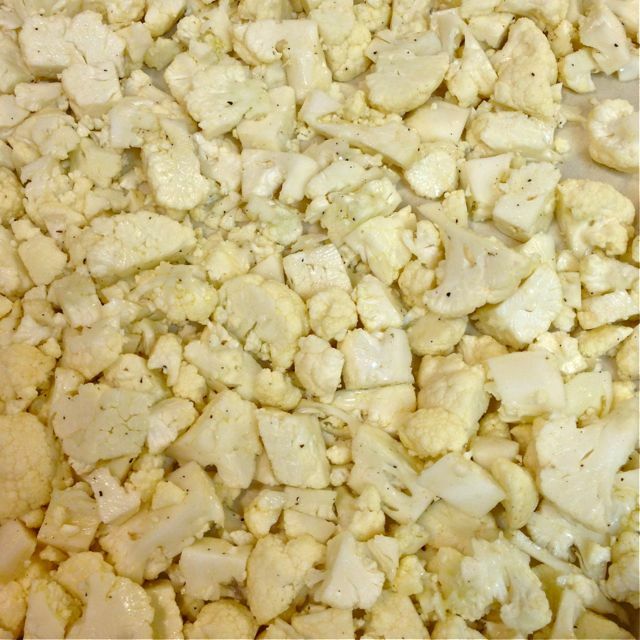 Arugula – add in a big handful or two when you add in the cauliflower. 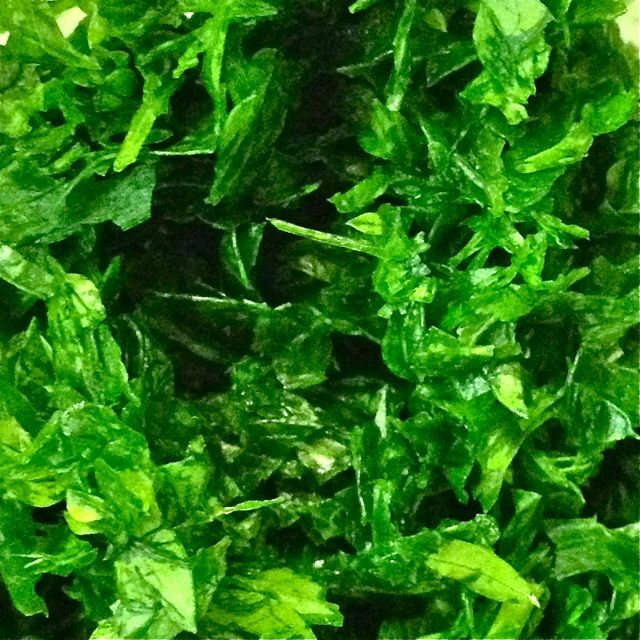 A little bit peppery and bright green – how can you go wrong?